Mountain biking is an inherently risky sport. The combination of speed, uneven, unpredictable terrain and the wide margin of human error — both yours and other trail users’ — all come together and make injuries extremely common. Still, we love mountain biking, and we know you do too. So, what can we do to mitigate this risk and stay on the fun side of danger? Be honest with yourself. Don’t sell yourself short, but don’t over-estimate your abilities either. Start by reading our Ride Levels page, and sort yourself into a ride group accordingly. If you’re unsure, it’s better to place yourself in a lower level, and switch upwards at the next ride if you felt that the lower level wasn’t challenging enough. Don’t forget: Fatigue will affect your ability to hold your line and execute maneuvers. If you have more skill than fitness, it’s better to ride with a group that will be doing less distance/climbing than risk crashing due to fatigue from riding with a group that matches your skills but far exceeds your fitness level. You can always work on your fitness and level up later! 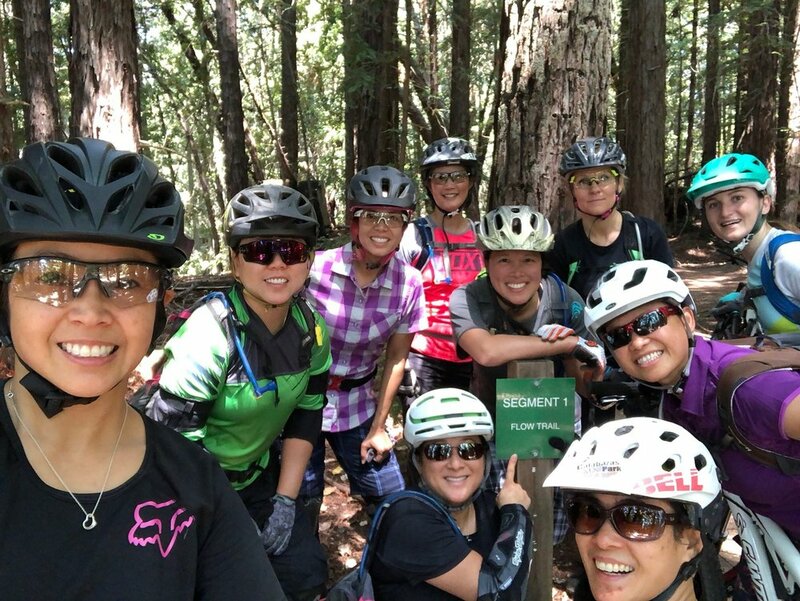 Our Girls Rock volunteers are there to guide you on the trails and while they will always try to help a rider in need, the responsibility and obligation to stay safe and be prepared lies squarely on the rider’s shoulders. That means you. If you know you drink like a camel, make sure your hydration bladder is full. If you know that you get hungry easily, be sure you have adequate trail snacks. Take care of your equipment and be prepared for all sorts of scenarios. We’ve covered the essentials in a blog post titled "Check Yourself; Don't Wreck Yourself" and highly recommend that you read through it carefully and follow the instructions. Go further and prepare for worst-case scenarios by getting trained in First Aid and CPR, wearing an emergency information bracelet or shoe tag, and making sure that someone knows where you are and what time you're meant to be done with your ride. Avoid collisions by never assuming that a rider approaching from the opposite direction is going to give way to you. Slow down, and look for indications that the opposing rider is going to let you pass. Do not try to squeeze by hikers or equestrians. Only pass them if they have seen you and have indicated that it's alright to pass. If you are stopping, immediately pull yourself and your bike off the trail. If necessary, call out to the rider behind you that you are slowing down or stopping. Do not stop where oncoming riders cannot see you, i.e. below a jump/drop or around a blind turn. Girls Rock wants everyone to have a fun, safe day on and off the trails. If you are enjoying an adult beverage on ride day, please follow the law and assume personal responsibility for your safety and others around you. Be familiar with your personal alcohol tolerance. It is not wise to drink if you are tired, sunburnt, concussed, upset, etc. Do not drink if you are a minor or in charge of minors. Do not drink if you intend to drive. No open containers -- keep drinks on host premises. Be prepared to show your ID. We want to continue to be able to offer our rides to our community. One accident could mean the end of our fun. Please enjoy yourself responsibly! If drinking alcohol, I assume the risks associated with alcohol consumption and take full responsibility for my own actions, safety and welfare. I further understand that I will be a member of a group embarking on a potentially dangerous activity and will conduct myself in a way that does not endanger myself or the group. Finally, if there’s anything you’re concerned or unsure about, ask any one of our Guides or contact us! We’re always happy to help sort a sista out. Want more information and advice on how to prepare for a ride and stay safe while mountain biking?